(L-R) Margaret Gay (cello), Patricia Ahern (violin), Patrick Jordan (viola), Elisa Citterio (violin), Mirko Trinchera, Her Excellency, Julie Payette. Sometimes, a context for those aims presents itself, unbidden. Her Excellency, Mme Payette chose all of the music that was to be a part of her installation this past Monday, October 2nd. The range of performers was wide, inclusive, and inspiring. Members of Tafelmusik were invited to take part because the new Governor General was once a member of the Tafelmusik Chamber Choir, an experience that she herself has characterized as transformative. Upon reflection, the ceremony was also one of the most eighteenth century experiences of my performing career! Unlike Dittersdorf, as artists today, we enjoy immense autonomy — as a general rule, the audience waits for us to take the stage, not the other way around. Monday’s performance was very much at the command of the powers that be, and I can’t say I have felt that so intensely before. Tafelmusik’s position on the day was to play the first movement of Mozart’s Divertimento in D major, K.136 (no second repeat, we had to be done in +/- 4 minutes and 15 seconds) immediately after the address of our Prime Minister, the Right Honourable Justin Trudeau, and before Her Excellency Mme Payette’s first address as the new Governor General of Canada. Not a bad spot! But not a spot that offered a great deal of flexibility. Rehearsal before the big moment in the Senate Chamber. During the ceremony, we were again, with all the other performers, in the holding room until we were taken to the green room. Our rehearsal the day before had not included the 21-gun salute being fired by howitzers on Parliament Hill, nor the shaking of the glass in the windows on our walk upstairs! I am not so accustomed to such displays of power, which would have routinely accompanied the presence of dignitaries in the eighteenth century. (L-R) Margaret Gay (cello), Patricia Ahern (violin), Patrick Jordan (viola), Elisa Citterio (violin), Mirko Trinchera, The Right Honourable Justin Trudeau. Immediately after we played, we were taken back to the green room. It was from there, via closed circuit TV, that we heard Her Excellency’s first official address. Her messages of inclusion, striving to achieve, working as a team, and making decisions based on evidence to create the best possible world for us all were genuinely inspiring. At the end of the ceremony, all of the performers were asked to wait in the green room until Her Excellency Mme Payette and the Prime Minister, his wife, and the Minister of Heritage, Mélanie Joly, had the opportunity to greet us. We had been informed of the proper protocol for addressing the dignitaries, and had all practised up in advance. When they joined us (we were given a ten-minute warning then a three-minute countdown), the day took a very welcome giant step forward into Canada in the twenty-first century. I tried to squeeze in the “correct” address but didn’t really have an opportunity because each of them was so warm and direct. Her Excellency Mme Payette wanted to know if any of us present had been in the orchestra when she sang in the choir (no, I missed her by one year). Elisa Citterio, our new Music Director was next to me on the receiving line with her fourteen-month old daughter in her arms — Olivia was definitely a hit! They spelled our name right! I truly wish that everyone in the orchestra and choir could have been part of this, but that was not to be. I know it would have meant a great deal to many of them, especially the people who have been here for even longer than I. Beth Anderson, our Director of Artistic Administration and Operations, was lucky enough to join us on this adventure. On the bus ride away from Parliament Hill, she remarked that she found it interesting that not one of the performers had actually been born in Canada. For a moment, I thought “That’s terrible!” but it quickly dawned on me that here we were, a group of high-achieving performers who have come together with the goal of creating a powerful team for good. Wasn’t that a big part of the inspiring message from Her Excellency? I am fond of the notion that we are all becoming ourselves in the context of a world that is changing around us. I suppose I am still “becoming Canadian” like everyone around me, and last Monday’s experience was a particularly proud and inspiring part of that journey. My Italian Adventure was born out of a desire to take you by means of music on a journey to the land where I was born and have lived. My hometown is Brescia, and although much less famous than nearby Venice, it played an important role in the history of music. One cannot pinpoint the date and place that the violin reached its present shape, but the studio of the violin maker Giovanni Paolo Maggini and his contemporaries in Brescia certainly contributed to the development of string instruments and to achieving the highest level of craftsmanship. String instruments from the seventeenth century had a very warm voice, and the Brescian consort of strings apparently brought to mind the sound of madrigals by Luca Marenzio, also from Brescia. Fontana, Marini, and Vivaldi’s father are also from this city. Brescianello, Steffani, and Locatelli were born in towns not far away (especially compared to Canadian distances! ), and for Castello the only references we have are Venetian. Our short trip takes us therefore to towns within a 200-kilometre radius and spanning just over 100 years. Other than the celebrated Vivaldi, the composers we will encounter on this journey are less known to the general public, but they give us an idea of what people listened to in baroque Brescia and Venice. I hope you enjoy this Italian musical adventure! Baroque music was born in Italy around the turn of the seventeenth century. 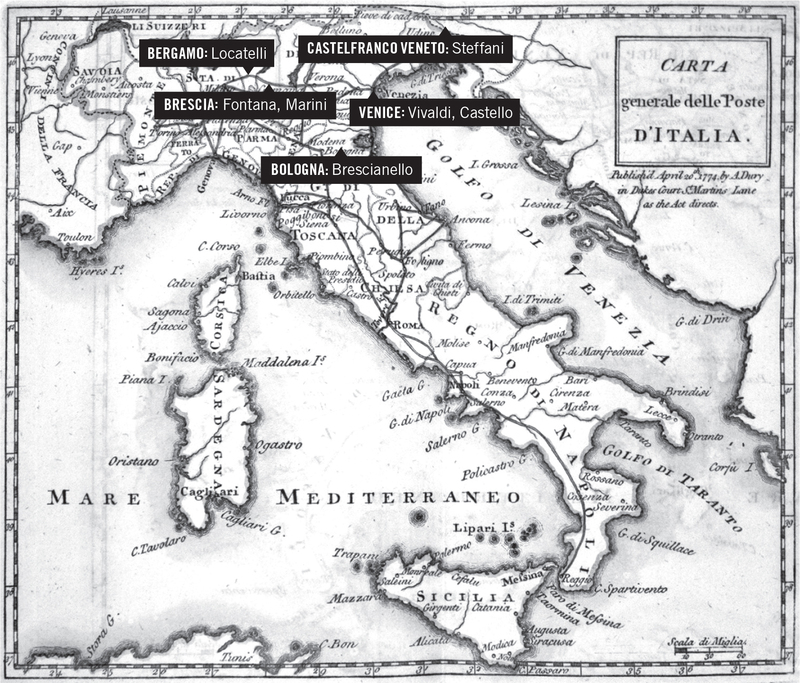 The innovative new forms of opera, sonata, and concerto developed there were spread to the rest of Europe through both printed music and the travels of Italian musicians. Our program begins with music by three of the pioneering composers of the era. Little is known about the life and career of Giovanni Battista Fontana beyond what is written in the memorial preface to his sole opus of sonatas, published posthumously in his native Brescia, an important centre of violin making. He went on to work in Rome, Venice, and finally Padua, and was praised as “one of the most singular virtuosi the age has known.” Fontana’s writing is very much akin to the vocal music of his generation and calls for the noble form of rhythmic flexibility singers called sprezzatura. In Sonata XIV, the two violinists rarely play at the same time, instead exchanging solos in dialogue almost like characters in an opera, then a burgeoning new art form. The dulcian (an early bassoon) joins later in a canzona-like section, playing a decorated version of the continuo line. Biagio Marini is recognized today mostly for his innovations in solo violin playing, not only technical displays, but highly imaginative writing that explored the instrument more fully beyond the norms of dance and consort music. Also Brescian, Marini worked at the cathedral of San Marco in Venice under Claudio Monteverdi, then travelled widely through Italy and Germany and as far north as Brussels. His Opus 22, published after returning to Italy, includes a number of short pieces for four-part strings. The Sinfonia terzo tuono is deliciously vocal, sounding much like a popular song, while the Balletto quarto Allemanno ventures into the realm of the silly: the first violin gets stuck repeating a three-note motive for most of the second half until a cadence is finally reached. As with Fontana, the life of Dario Castello is not well documented. He is identified as the chief wind player at San Marco on the title page of his first book of sonatas. He calls his works Sonate concertante in stil moderno, making it quite clear that he is writing in a new style. He makes use of a wide variety of figures, with frequent, bold, and sometimes jarring changes of tempo and affect. Sonata X gives a distinct voice to the dulcian, an instrument Castello possibly played himself. Italian musicians were in high demand outside of their homeland, particularly at the Catholic courts of the Holy Roman Empire. Thus the talented choirboy Agostino Steffani was recruited by the Bavarian court, arriving in Munich on his thirteenth birthday. No expense was spared on his education. He was sent to Rome and Paris for further study, and employed back in Munich as organist and director of chamber music. Mostly appreciated for his vocal duets, he also wrote for the stage, although he did so clandestinely later in life because of the distinguished status he had attained as a cleric and diplomat at the Hanoverian court and elsewhere. Niobe was composed for carnival in Munich and is based on the story found in Ovid’s Metamorphoses of a queen that angers the gods by boasting about her children, who are slaughtered as punishment and Niobe turned to stone. Pietro Locatelli was a native of Bergamo, but by age sixteen he had joined the vibrant musical community that served the many churches and influential families of Rome, under the guidance of Arcangello Corelli. His earliest published music shows him to be an accomplished disciple of Corelli, but already exhibiting some interesting ideas of his own. Notably he added a second viola part to the orchestral texture. He travelled extensively as a soloist and became known for his acrobatics on the violin, the high fees and lavish gifts he received from patrons, and his extravagant clothing (with the implication that it was above his station). It was customary for composers to do something special with the final piece in a published collection. For the last of his Opus 4 concerti grossi, Locatelli writes for four solo violins instead of the usual two. The soloists are at first heard one at a time, then mostly in pairs, but there are moments where all the violins make a glorious noise together. In the last movement there is a lot of playful banter in which the violins echo each other. Giuseppe Antonio Brescianello was another talent imported from Italy to Germany, where he was ultimately triumphant in what was evidently a fierce competition with the native German Reinhardt Keiser over the position of Kapellmeister at Stuttgart. The Suite in G Minor demonstrates that he became proficient in the so-called “mixed style” popular in Germany in the eighteenth century, that melded elements of both French and Italian. The Ouverture and most of the dances exhibit French traits, while the composer’s Italian origin shines through most clearly in the Siciliano. In The Four Seasons, Antonio Vivaldi uses his signature form, the solo violin concerto, to paint musical pictures of the seasons, supported by sonnets which are actually imbedded in the musical score. For Autumn, he chooses the key of F Major, strongly associated with hunting horns, which suits the last movement in particular, but is evident already in the opening solo of the first movement. The ensuing rambunctious solo passages are specifically designated l’ubracio (the drunk) in the score, as the harvest is celebrated perhaps a little too enthusiastically. Baroque composers often used long sustained notes and stable harmony to represent sleep or repose, but Vivaldi portrays the alcohol-induced slumber of revellers with unsettling harmonies that refuse to resolve comfortably, and a further restlessness is added by incessant arpeggiation from the continuo instruments under the muted strings. The finale vividly captures images of the hunt, complete with horns, barking dogs, gunshots, and even the final death wail of the cornered animal. their celebrations end in sleep. to the delights of sweetest sleep. the wild beast flees, and they follow its trail. the beast tries to flee but is overcome and dies. The oboe was a relatively new instrument on the Venetian scene at Vivaldi’s time. In 1704, it began to be taught at the Ospedale della Pieta, where Vivaldi taught violin, and he came to use it in many of his concertos. The double concerto in C Major makes some interesting departures from typical concerto form. Instead of the usual orchestral introduction, the oboes begin the piece without the strings, who come in only later with contrasting material. Also, the second and third movements begin with essentially the same music, only in the minor mode in the Largo and the major mode in the Allegro. Join us for Elisa’s Italian Adventure from October 11–15, 2017 at Jeanne Lamon Hall, Trinity-St. Paul’s Centre. Tickets are available here. Summer afternoons in my high-school days (the “golden years” of the CBC) I listened to classical radio programs, and thus became an avid Mozart fan at age 17. I even attended the Salzburg Festival when I was 23. I took piano lessons for about eight years, and when I was older, I sang in the alto section of our church choir when they performed Handel’s Messiah. Yes, I did finally “do” a Sing-Along Messiah a few years ago. Wish I had done it sooner, and more often. Approaching my sixties, I found that a program with a 110-piece orchestra was rather tiring after a long day’s work, so I was delighted when a colleague offered me a Tafelmusik subscription she had “inherited.” I forsook the TSO, and went on to continue her subscriptions. For about 25 years I went to dinner and Tafelmusik concerts with my best friend. For 14 of those, I came in from Fergus, Ontario by car, and later, by bus. Tafelmusik was one of the reasons why I moved back to Toronto. Baroque and classical music suit my personality. They’re structured and polite, even when they’re emotional. You know where you’re headed, but the fun lies in getting there. My mother’s family lived at 103 St. George Street. They were Methodists, so I like to assume they attended church at what is now Trinity-St. Paul’s Centre. This prompted me to donate four seats in the Balcony, commemorating three generations. There is a big gap in my life since I broke a third vertebra a year ago. I’m hoping that one day I’ll be able to attend the occasional concert at Trinity-St. Paul’s Centre. Classical music is what keeps me going, and Tafelmusik has been my primary source. My sincere thanks for years and years of enjoyment — of the pre-concert talks as well as the concerts. In The Four Seasons, Antonio Vivaldi uses his signature form, the solo violin concerto, to paint musical pictures of the seasons, supported by sonnets which are actually embedded in the musical score. For Autumn, he chooses the key of F Major, strongly associated with hunting horns, which suits the last movement in particular, but is evident already in the opening solo of the first movement. The ensuing rambunctious solo passages are specifically designated l’ubracio (the drunk) in the score, as the harvest is celebrated perhaps a little too enthusiastically. Baroque composers often used long sustained notes and stable harmony to represent sleep or repose, but Vivaldi portrays the alcohol-induced slumber of revellers with unsettling harmonies that refuse to resolve comfortably, and a further restlessness is added by incessant arpeggiation from the continuo instruments under the muted strings. The finale vividly captures images of the hunt, complete with horns, barking dogs, gunshots, and even the final death wail of the cornered animal. Hear a performance of Vivaldi’s “Autumn,” the second in a complete cycle of his The Four Seasons performed this year, showcasing Elisa Citterio, in Elisa’s Italian Adventure from October 11–15, 2017 at Jeanne Lamon Hall, Trinity-St. Paul’s Centre. Tickets are available here. Join Elisa for Elisa’s Italian Adventure from October 11–15, 2017 at Jeanne Lamon Hall, Trinity-St. Paul’s Centre. Tickets are available here.